On Monday, I was overcome by emotion at the devastating stories of Muslim immigrants being cut off from their rightful homes — families, livelihoods, and beloved communities — here in the U.S. and of refugees, who had been promised entry on asylum, being sent back to waiting gallows. I became teary-eyed and shaky as I thought of my multinational clutch of friends, and of my family members, living and deceased, and ancestors, who have migrated within or emigrated from other parts of the world to this nation. The What-Ifs spiraled through my mind: What if friends I know are deported or denied re-entry? What if the ban extends to any immigrant who does not have full citizenship and my dad (who is not Muslim nor from a Muslim country) too becomes a victim of this gross xenophobia? 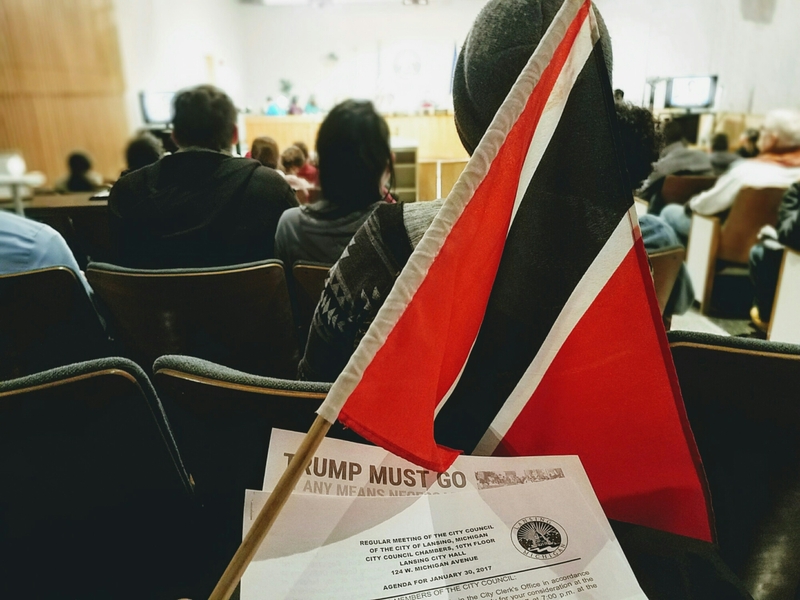 Angry and proud, I carried the flag of my father’s island into a city council meeting to show my support for a resolution to make our community an official sanctuary for all immigrants. My family has crossed many borders and belonged to many nations. My father is from Trinidad + Tobago and came to the U.S. with his steel pan band in the 70s. His father and his maternal grandmother island-hopped from Barbados to Trinidad. I’m told our people are scattered throughout the Caribbean. I have cousins from both islands who are now legal residents in the U.S.
My maternal grandmother is a 1st-generation U.S. citizen whose Canadian parents immigrated to Pontiac, MI. Her maternal grandmother was a Jew from Stuttgart, Germany who, at 17 years old, immigrated to NYC in 1880, then crossed the northern borders into Canada. Her maternal grandfather was a slave born on a plantation in Virginia. He enlisted in the Union Army, fought in the Civil War, and moved to Buffalo, NY following his honorable discharge before crossing into Canada. My mother welcomed people of all cultures into our home and, when I was a child, even hosted two Belizean women as guests for a short stay. In her almost 40-year career in social work, she wholeheartedly served refugee and other immigrant communities. She bonded with them, kept in touch after their services ended — they invited her to dinners, baby showers, and birthday parties. She became a trusted friend who their children called Auntie or Gramma. My extended family and friends come from many nations or are descendants of immigrants or are married/committed to and have built families with immigrants or descendants of immigrants. My neighbors are from Vietnam and Cuba — I’ve watched their children grow up alongside my son. There is no part of my life or my heart that has been untouched by an immigrant. My hope is that the #LoveLansing City Council acts in alignment with our mayor’s pledge to protect our refugee and immigrant community and resolve to declare my hometown a sanctuary city. So ask me again why I am outraged? Why I’m sad? Why I feel threatened? I’ll gladly repeat it over and over and over: It’s literally in my DNA to give a damn! Read our Mayor Virg Bernero’s pledge via Fox 47 News.